The next Republican debate is just around the corner. It's going to be a smaller affair than the last few — only eight candidates will be on stage during the main event, compared with the 11from just two debates ago. For many of those eight candidates, the stakes are higher than ever, and for a few, the debate is make-or-break. Of course, every candidate can have a good or a bad night, but the consequences of success and failure are far greater for some of the Republicans than others. In particular, there are three candidates to watch at the next Republican debate. 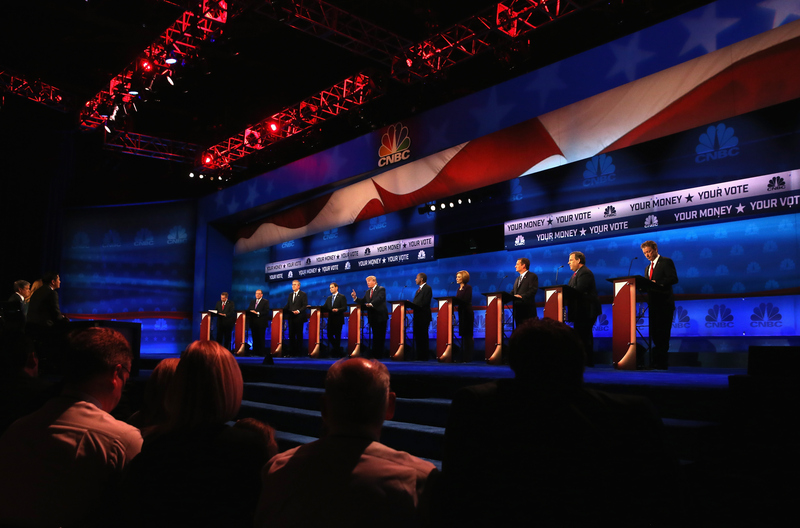 A lot has changed since August, when Fox News hosted the first GOP forum. Back then, Jeb Bush was a frontrunner, Ben Carson was an afterthought, and Donald Trump was a joke. Now, Carson is a frontrunner, Bush's campaign is on death's door, and Trump is... well, some things haven't changed. Meanwhile, two people have dropped out of the race entirely, and two more have been demoted to the undercard debate. Out of the remaining candidates, some need to score a home run on Tuesday; other simply need to not screw up too obviously. And some, frankly, are toast no matter what they do. Let's take a look. Fiorina enjoyed a burst of support after her competent debate performance in September. But that bubble quickly burst, and she's currently polling at around 3 percent. However, she's made no huge missteps on the campaign trail and is still one of the best debaters in the field. There is, at least in theory, still a chance for her to break through again. But for that to happen, she'll need to expand upon her existing strengths, not simply reiterate them. Fiorina has been an effective advocate for conservative causes at the debates; what she hasn't done is demonstrate why she'd be a better president than the other Republicans. At the next debate, Fiorina would be wise to illustrate the differences between her and everyone else on the stage; if she doesn't, she risks falling further — and more intractably — into the bottom tier. Carson and Trump are statistically tied for first place, but Trump hasn't suddenly been hit with several distinct and unrelated scandals as Carson has. In addition to his bizarre theory that the Egyptian pyramids were used to store grain, Carson landed himself in hot water when it was revealed that he falsified several aspects of his biography. This puts him on the ropes in a way that he's never been before. While neither of these revelations is damning enough to single-handedly kill Carson's campaign, he'll almost certainly be asked about one or both of them during the debate — not only by the moderators, but by the other Republicans on the stage. Carson has steered clear of one-on-one confrontations with his opponents so far; if he's forced into one on Tuesday, he'll need to demonstrate the type of combativeness he's avoided thus far. If not, he may not be in the lead for much longer. Bush has been an underwhelming candidate from the get-go. Despite leading in endorsements and having a virtually bottomless chest of money, his poll numbers have languished for months, and his spectacularly counterproductive attack on Marco Rubio during the last debate may have put the nail in his campaign's coffin. I'm of the mind that a Bush comeback is impossible at this point, but if I'm wrong, the path to victory runs through this debate. It's not that Bush needs to land a knockout punch on any of his competitors. In fact, he needs to do the opposite: Having already proved that he can't tough-talk his opponents into submission, Bush needs to be cool, stay above the fray, and avoid doing anything disastrous. While that won't be nearly enough to put him back into serious contention, it could be enough to keep his campaign on life support for a bit longer.